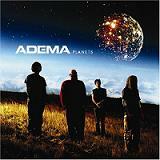 Review: "Adema: Planets" - Sea of Tranquility - The Web Destination for Progressive Music! California's Adema are back with their third album Planets and a new singer. Gone is original belter Marky Chavez, replaced here with new member and former Rewind Yesterday singer Luke Caraccioli, who has a very different vocal style from Chavez, so as you can expect Planets sounds almost like a new band altogether. While some remnants of the bands earlier muscular & raunchy metal sounds are still apparent, like on "Shoot the Arrows", "Barricades in Time", the rap-metal of "Bad Triangle", and the heavy "Chel", for the most part the CD is filled with melodic and atmospheric rockers, acoustic pop songs, and some tunes bordering on the dreaded "emo" tag. This change in direction might be perfect for alternative radio and MTV, but longtime followers of the band might be a bit dissapointed. One song, "Rise Above", does have hit single written all over it, and features some catchy vocals from Caraccioli and a nice wah-wah guitar solo. As sad as it might sound, one of the strongest tunes on the CD is "Estrellas", which is really just a cover of Metallica's "The Thing That Should Not Be", which is ten times heavier than anything else on the album. Fans of Incubus, Hoobastank, Creed, and the like who have never listened to Adema before will probably dig this. However, if you were a fan of their first two CD's, proceed with caution, as this is a different beast altogether.